The Politics of Capitalist Transformation is the only book-length study of the highly protectionist Brazilian informatics policy from its origins in the early 1970s to the collapse of the market reserve in the early 1990s and its impact in subsequent decades. 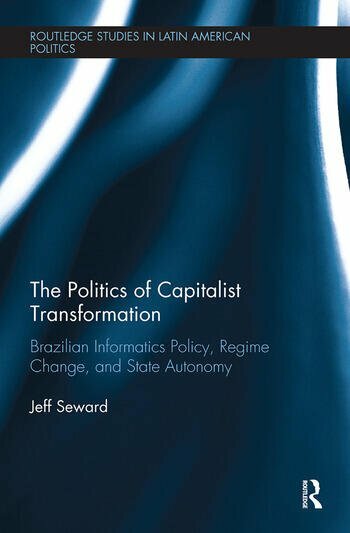 Jeff Seward provides a sophisticated political analysis of how state activists constructed high levels of state autonomy to try to shift Brazil to a new variety of capitalism by eclipsing the multinational companies (especially IBM) that dominated the Brazilian computer sector and replacing them with local companies with 100 percent Brazilian technology and ownership. This ambitious policy required repeated shifts of political strategy and policymaking institutions to respond to a constantly changing economic and political environment as Brazil made a dramatic transition from military dictatorship to democracy. The innovative framework to analyze state autonomy and the sophisticated political analysis of the policymaking process will be of interest to scholars and students of Brazilian and Latin American political economy, varieties of capitalism theory, state theory, democratic transition theory, and high technology policymaking in developing countries. Jeff Seward is an associate professor in the Department of Politics and Government at Pacific University. His research interests include comparative politics (with a special emphasis on Brazil and Latin America), political philosophy, political economy, and politics in literature and film. ‘"It’s time for us to compete with the big boys!" was a widespread sentiment in Brazil during the seventies and eighties, referring to IBM and other giant globalized informatics enterprises. And so Brazil gave it a try. Its bold and fascinating effort, perhaps the last major ISI project in Latin America, failed in the end. But Seward’s book – deeply researched, extremely well written, analytically rich – tells this important and instructive tale better and more comprehensively than any other work I know. At one level this is a case study. In social science graduate training today, rhetoric honors "multi-methods" but reality often treats case studies as inferior to big data, econometric techniques, formal theory, and formal experimental designs. This book reminds us how indispensable case studies are and how valuable a fine case study can be. At another level the book is informed by and explores theoretical literatures on state autonomy, regime change, varieties of capitalism and the causes and effects of these phenomena. It draws hypotheses from those literatures, tests them with the case study data, and generates new hypotheses from those data.